Sailing out in Eyjafjordur today was very good with warm south winds again and almost flat seas. Just southern Hjalteri we encountered a group of three humpback whales. So we were able to travel between the whales, and three of the individuals we identified as the same animals from the previous day: “King Loui”, “Blowromir”, and “Millennium Falcon”. There were also two other whales swimming in the vicinities, "Fjall" and "Depill". On the second tour, the weather conditions were very similar, and also the whales. However, now we had a group of four animals swimming together. 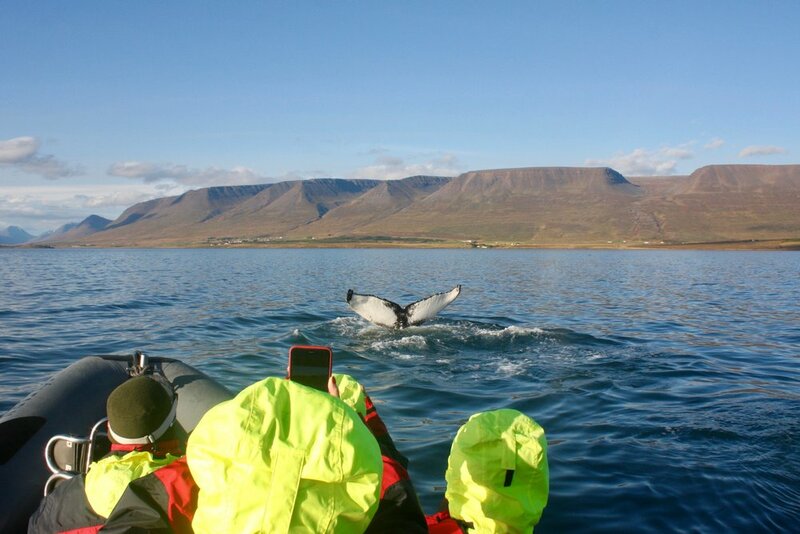 What an enjoyable day in our astounding Eyjafjordur and its whales.